Surveys are an effective method for business owners and marketers to receive feedback from customers. Knowing which products and services most excite your clientele helps you serve them more effectively, leading to repeat business and a healthier bottom line. What’s the best method for conducting these surveys? We’ve all seen the invitations on our fast food receipts to complete a survey and receive a reward. Do these work? With today’s technology, business owners have many other options available that could collect feedback more efficiently. Why are they still using this method? Is there a better answer? We have examined these questions in detail in our post, When You Want a Feedback from Customers Make It Easy for Them to Speak. To dig further into the issue, we conducted a survey of our own. 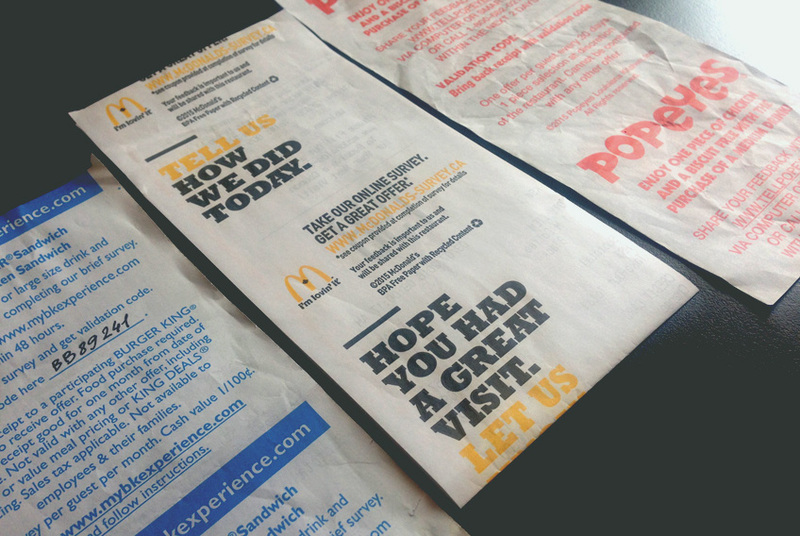 Our goals were to gain insight into how Canadians perceive fast food restaurant receipt surveys and discover if we could improve on this method of marketing. We surveyed approximately 500 restaurant customers across Canada. Our results provide informative insight for marketing and business teams. We discovered that diners are typically willing to share their thoughts, provided that marketers make the survey process as convenient and rewarding as possible. Let’s examine our survey, then take a look at the insights it offers for marketing strategies. Around 80% of Canadians go to restaurants either weekly or a couple of times per month. This means there are plenty of opportunities to get feedback from repeat customers. 44.6% go to restaurants a couple of times per month. If the right reward is given, you might get these people into your restaurants more often. Fast food receipts: Where do they end up? 48.6% of the respondents said that they throw away their fast food receipts immediately, meaning almost half of your customers will never provide feedback, even if they would have been interested in doing so. 22.5% take their receipt home, but do so to destroy it, not to take the survey. This indicates the survey is not something of great interest to customers. Only 10.7% of customers take their receipts home with the intention of filling out the survey and getting rewards. We didn’t ask these customers if they follow through and fill out the survey or not, but, if we assume that around 90% of them actually do take the survey, we are left with around 9.6%. This translates to receiving feedback from less than 10% of your customers. Survey rewards: Are they noticed? A stunning 45.9% of customers didn’t even notice that their receipts had offers. This is pretty amazing, given that most companies prominently print it in color on the back of their receipts. Clearly, something in the marketing design must change to increase visibility and boost the feedback response. Of those customers who noticed the survey invitation, only 56% took the survey. We asked the other 44% for the main reasons they didn’t take it. The biggest barrier was that customers didn’t think the reward offered was worth their time. The other two main reasons were “forgot about it” (23.5%) and “absence of time” (18.9%). 13% of customers thought that the survey was too complicated. 85% of respondents are ready and willing to provide feedback to restaurants, provided there is a better way to do it. With this in mind, restaurant owners should consider how to seize this opportunity with the best feedback method possible. These results provide the following insights into this method of marketing. Restaurants are not getting feedback from the majority of their customers. As we can see from the Canadian respondents, feedback is currently only provided by around 9-10% of customers. Other customers, who would like to provide feedback, never notice how to do so or are deterred by the method used. These are great opportunities lost, as obtaining feedback from diverse customer groups can have a big impact on improving operations. This includes the opportunity for headquarters to gain a better understanding of the operations at specific franchise locations. Restaurants can increase the quantity of engaged customers and improve the quality of feedback by addressing several key areas. Send receipts electronically, via texts or emails that include invitations to provide feedback. 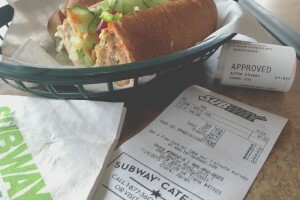 This will capture customers who throw receipts out – 48.6% of customers who visit restaurants. Ensure customers realize they have been given an opportunity to provide feedback. This will affect the 45.9% of customers who currently don’t notice surveys. Make rewards compelling enough that customers are enticed to complete a survey to earn them. This will attract the 44.0% of those who notice surveys but never participate in them. Offer a way for customers to immediately engage. Allow them to provide feedback on the spot and receive their reward instantly. As we can see, almost 42.4% of respondents didn’t take the survey because they “didn’t have time” or “forgot.” Today’s customers are busy. If something doesn’t get done right away, it will probably never happen. As they move on to more important matters, the opportunity for feedback is lost. Allowing customers to provide feedback immediately helps capture the 42.4% who are willing to take a survey but never do. Create surveys that are simple, fast, fun and rewarding. Often, surveys are boring, are filled with complex matrix questions or require numerous steps to complete. Keep it simple (e.g. Answer 3 questions via text and get a free drink), or divide your big survey into 3-4 smaller surveys. The initial survey can tackle the most important questions, and you can offer customers the option of answering more questions for a better reward. (Answer 3 questions to get a drink or answer 5 questions to get a burger and a drink). Automate to simplify even more. It is important to note that most of the initial questions you are asking customers (e.g. visit date and time, restaurant number, location, etc.) can be easily automated using technology to save the customer’s valuable time. Implementing these changes in your survey strategy will entice the 13% of customers who think surveys are too complex. Customers are willing to participate and provide feedback. Our survey shows 85.8% of customers are willing to provide feedback if they are given a better way to do so. Restaurants can seize this opportunity. Multiple new technologies are available to collect customer feedback on location. These eliminate delay and capture customer attention immediately, removing many of the barriers to survey completion that our questionnaire revealed. Potential solutions include on-site survey stations, mobile apps that promote surveys based on customer location and a simple interactive text message-based survey on restaurant tables. 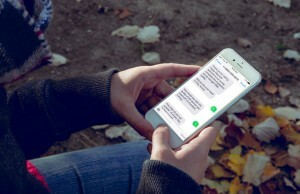 If your company is interested in learning how to collect better feedback from your customers, we are offering a free consultation and a highly efficient text messaging survey at no cost for a limited number of restaurants until April 15, 2016. Contact us to take advantage of this offer today and start seeing better marketing results tomorrow.